GET REAL is Billy's studio follow-up to LIFE SO FAR. From matters of the heart, to geo-political intrigue, GET REAL invites the listener to climb into a "percussion-rich" universe full of sonic exploration and emotional adventurousness. GET REAL is filled with sounds that come from homemade and recycled object instruments ("industrial re-percussion": 5 gallon water bottle, pots & pans, bottles & cans, buckets, garbage bins and carpet tube marimbas), as well as a host of more traditional sounding instruments (guitar, bass, Middle Eastern & African percussion), and LOTS of voices! LIVE 8 SONGS is a portrait of a turn-of-the 21st century hootenanny, in the grand folk tradition, where everybody's in the band. With the exception of the bonus track, "Billy Jonas LIVE" was recorded all during one concert on February 16, 2002, by Neale Eckstein at Fox Run, in Sudbury, MA. It features Billy solo, accompanied by a stellar "audience orchestra" who learn their parts as they go. Special guests include Eric Schwartz (backup vocals on "Coup d'Etat") and David Wilcox (backup vocals on the bonus track "God is IN"). LIFE SO FAR the first solo studio recording by Billy Jonas, singer-songwriter, re-percussionist, multi-instrumentalist, and former member of the highly acclaimed funky folk duo "The Billys." LIFE SO FAR sparkles with unique perspectives and found sounds. Songs filled with hope, yearning, wonder, and wisdom include special guests Bill Melanson, David Wilcox, Nance Pettit, Lynn Rosser, and Chris Rosser on harmonies; Glen Velez on percussion; Robert Moog on Theramin; and Zimbabwe's 9 man Black Umfolosi voice and percussion choir. TIME HAS COME is the 1993 magnum opus of THE BILLYS, an original, singer-songwriter duo, whose "foraged folk music" features great vocal harmonies, homemade "industrial re-percussion" instruments, and guitars. The recording features an eclectic array of songs of hope, love, political intrigue, and late night travel vortices. Some of the homemade instruments include the 'maBOOMba' -- a marimba made of carpet tubes; 'tin can xylophone' -- fashioned from soup cans; and a 'kutlery kalimba' -- exactly that! TOOT THE HORN: This is an album that was created for PJ Library. Funky Jewish music for the whole family! Two brand new songs, six remixed songs and five previously released songs -- all guaranteed to inspire wonder, joy, and singing. BUILD IT BACK AGAIN (another Parent's Choice Gold Award!) 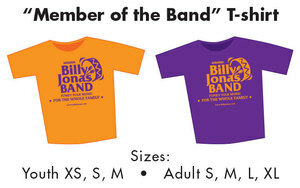 is the first "created-by-the-band" effort of the Billy Jonas Band. The all original funky-family-folk songs are designed to tickle the fancy of adult listeners while captivating the minds and ears of younger listeners. “This CD is about maintaining optimism,” Jonas explains. “It’s about finding a way to joyfully embrace all of life: creation and destruction; ease and challenge; failure and success.” The songs invite singing along, queries, inspiration and wonder! HAPPY ACCIDENTS (Parent's Choice GOLD award! ), is funky folk music for the whole family. It's musical medicine for the mind, body and spirit of young and old alike. It's a splendiferous sonic sojourn into the near and far reaches of fun and fantasy, possibility and purpose, word-play, wonder, heart, and hope. The arrangements include Jonas' trademark homemade "re-percussion'' drum set, as well as a glorious panoply of found sounds (rubber bands, body percussion, door squeaks, apple cider jugs), exotic kalimbas and marimbas, conventional instruments (guitars, bass, piano, banjo, accordion, tuba) and 2-, 3-, 4-, and 5-part vocal harmonies. The 18 songs feature 13 originals, and 5 adaptations of traditional tunes, all destined to inspire and inform. EVERYBODY'S IN THE BAND (2004, Parent's Choice Award winner!) is Billy's latest family/young audience DVD release. It features hundreds of enthusiastic kids, as well as a special guest, Grammy Award winner Alison Krauss. 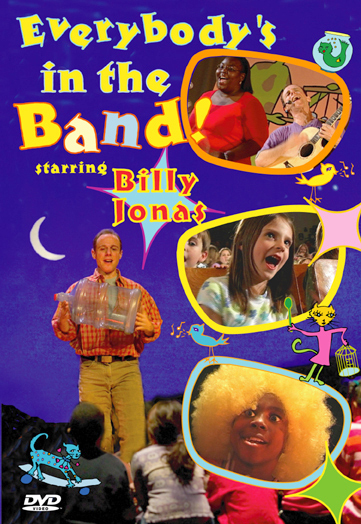 "Everybody's In The Band" continues in the tradition of Billy's first video, "Bangin' & Sangin'" (2000, Parent Choice Award winner!) with the idea that music can happen ANYWHERE and ANYTIME, with ANYONE and ANYTHING! 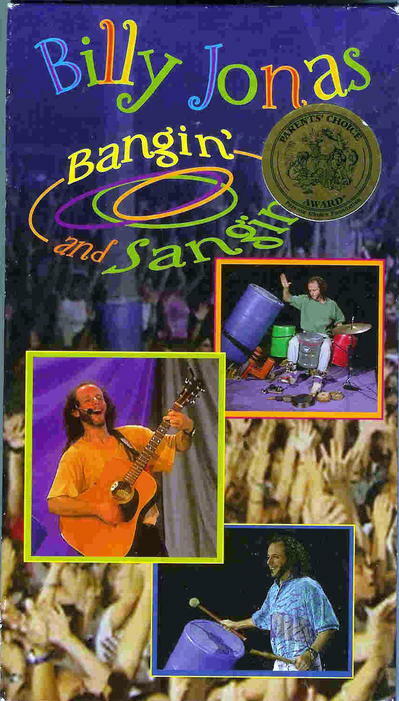 This video is available in both DVD and VHS formats. What Kind Of Cat Are You?! On WHAT KIND OF CAT ARE YOU?! the main instrument is YOU when you sing and bang along with Billy Jonas' cd "What Kind of Cat Are You?!" Billy Jonas' fans will make music in all new ways as they enjoy this award-winning (2002 Parent's Choice Gold Star) collection of 13 interactive songs. Like a virtual song leader at a lively campfire, WHAT KIND OF CAT ARE YOU?! encourages everyone to use their own voices and any handy item to "sing, dance, snap, tap, clap their hands and join the band! As with all of Billy's music, the main instrument for WHAT KIND OF CAT ARE YOU?! is the audience: call-and-response lyrics, open-ended questions, and quiet instructions that inspire movement and imaginative thought. Nearly every song on "What Kind of Cat Are You?!" was inspired by and developed in performances with live audiences. BANGIN' & SANGIN' is Billy Jonas' first family/young audience video and is guaranteed to inspire audience participation! Filmed in 1999 at Blue Star Camps in Hendersonville, NC and TCI studios in Asheville, NC, it immediately received a Parents' Choice Gold Star rating and earned a place on The New York Times "Best" listing. You'll be on your feet before the third drumbeat!In Bangin & Sangin', Billy performs his original songs and a few family favorites with voice, guitar, and "industrial re-percussion" - a collection of instruments made from found and recycled objects. His unique brand of "forged folk music" has delighted thousands at clubs, schools, festivals, coffee houses, and theaters. Kids of all ages can't resist bangin' and sangin' along with Billy! 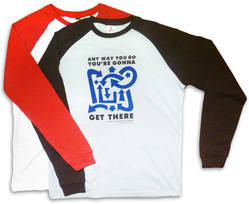 Only available by phone, email, or mail order. 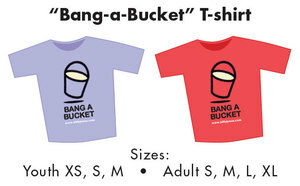 Specify size and color when ordering.